2nd Section KCC Quads in the foreground. My opponent, Ian, ponders his move from across the empty chair. With some lucky maneuvers, I managed to get the full point in a time scramble. This gave me clear first in the Quads with a 3-0 record. In the background, you'll see just some of the trophies awarded to KCC Members for their accomplishments during the Kenilworth Chess Club Championship last month. A special thanks to Glen Hart for graciously donating some fritztrainer opening CDs for prizes AND left overs to the KCC Library. Thanks to Joe as well for getting the trophies good to go. And of course to John for his coverage of the event. 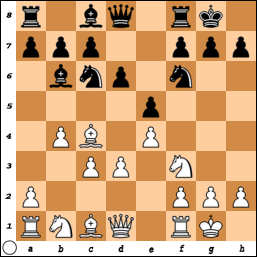 If you read a number of books on Karpov's greatest games, often the first entry is Karpov vs Gik from 1968, an instructive destruction of the Sicilian Dragon. Too lazy to play the the moves on chessgames.com, you say? Well, the following video does for this game what the amuse bouche does for the seven course meal.... Enjoy! This was from the Carrelli-Hart game round 1 of the KCC Quads last week. Full game with analysis can be found on John's website. I thought about this position for some time- after the game. What is my plan here? I ran it through Rybka to see what that little fish thought, but it came up with 20 different options all with same = result. Well, that's because the position is very =! I figure whoever comes up with the better plan and can implement it in the game would be able to eek out the edge. Let's play chess. Well, what would annoy White in this position? Whenever the LSB is outside of the pawn chain, Bg4 becomes very annoying. So my first priority was to come up with a plan that would solve this. I didn't want to play h3 because I felt that would just weaken my kingside needlessly. I also thought I would like to, at some point, play Be3 and exchange that annoying Bishop. If he takes me, that cracks open the f-file which would put even more pressure on f7. But this was too soon. I was thinking perhaps Bg5 first to egg Black into playing h6 and "poke a hole" as Mark would say. Then back to e3 to offer the exchange. I liked this idea, but just not yet. Black could use the same idea with Be6. I wanted to stir it up a little bit more. Then f7 became a focal point...I have Qb3 and Ng5 to put pressure on that square, but it can easily be defended. Would that dis-coordinate Black's pieces? I ended up playing Qb3 with the idea of avoiding troubles with Bg4, build more pressure on f7 to tie down Black's pieces, and finishing development. I would follow it up with a4 and try to use my space advantage to better organize my pieces- which just may lead to something. If you view the full game, Black's pieces did get uncomfortable. Was that necessary? I don't know. 1. Qb3 Black has a5! and it is White's pieces get pushed around for no reason. If 2. b5 a4! and White's pieces look even more awkward. Note that this position is probably still = (and may not even be Black's best). More precise would be 1. a4 threatening to trap the bishop, and after 1. ...a6 2. Qb3 or 1...a5 2. b5 followed by Qb3. A better way to reach what I wanted. 1. Re1 with the idea of looking for d4 creating a central pawn duo. Of course this can't be played right away(that annoying Bg4 becomes a factor). This requires some prep work, but it would stir up more trouble than my line. I am curious to see what everyone else thinks? Any ideas? Boring position? "I offer a draw" - Ian? I'll be away this week and will catch everyone the last round. Good luck to everyone playing in the Quads. -I just slapped three posts up, so don't forget to scroll down. This will be the first of a few "How To" posts I will offer in an attempt to get others to post their interesting positions and/or thoughts from their games. The first thing you would need is a blogger account. The Kenilworth Kibitzer is open to all KCC Members, so please let me know if you are interested in getting an account. 1) First thing is first...you need to get a position to generate! So play a non-wussy game. 2) Go to this free Chess Diagram Generator and edit the board. You can pull off pieces and add pieces at will. 3) Select whose move it is (Black or White), the size of the diagram you want (I choose Medium), and leave the Grid box checked off for us amateurs. 5) Once you have that entire line copied, you then would paste that code in blogger. Blogger will recognize it and generate your diagram. Note that when you paste it in the white box on blogger, it will look like gibberish, but once you preview or post it, it will look like what it is suppose too. 6) Add whatever text you want before and after, and there you go. Next "How To" post will show you how to post your game in one of the replay windows you have seen here. March 25 Final round of the KCC Quads. I wanted to note that we will quickly have the KCC Championship Awards Ceremony before the last round starts. April 15 - Lecture by IM Marc Esserman on the Smith-Morra Gambit. $10 and open to all. The Consultation Games' have been a club favorite, I hope everyone can attend!